Flue Steam provides a wonderful selection of services to contribute to the continual functionality of your kitchen. Read on to find out about our current offerings and see which services are best for you. Your kitchen’s flue is an essential element in your kitchen because it removes hot exhaust gases that are constantly created during cooking. Flue cleaning removes the natural oils and fats that become vaporized and drawn into your exhaust system when you cook. Having a properly cleaned flue is highly important to keep your kitchen system working efficiently and to prevent flash fires. At Flue Steam, we offer clients both hand scraping and steam cleaning services. Hand scraping is the most commonly done method because it just involves physically scraping off the grease accumulation from the exhaust system walls. However, it’s not always thoroughly cleaned via this method because the technician can’t always access all parts of the flue. Steam cleaning involves setting up special equipment and using high-pressure hot water to reach every single part of the flue, achieving the most thorough cleaning. While flue cleaning is the proverbial “big cheese” service we provide at Flue Steam, we also provide other, rather minor, maintenance-related services, such as checking belts, greasing bearings, and replacing parts. Since our main focus is on flue cleaning, you’ve probably realized by now that fire safety is very important to our company. We want you and your kitchen to be kept 100% safe from fires, and regular flue cleanings are a big part of that. In addition, we also provide fire safety services for kitchens, such as exchanging your grease filters, automatic fire suppression systems, and portable fire extinguishers. 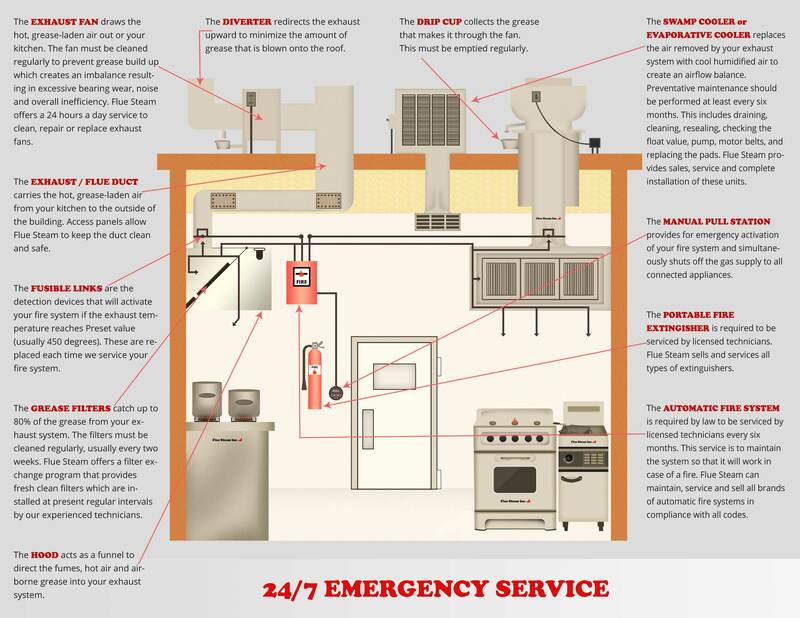 Our assortment of fire safety service is our way of helping you avoid costly kitchen fires. We know how important having your kitchen in tip-top shape is, so that’s why we offer emergency service to all our wonderful customers. If an urgent need arises with your flue fire safety equipment, it often simply can’t wait until business hours. Get the help you need right away by calling 800-700-FLUE anytime 24/7. One of our company trucks will be right over to meet your need at a reasonable price. If you have any questions or concerns about your kitchen’s flue, fire safety equipment, or anything else, please give us a call at 800-700-FLUE or email contact@fluesteam.com. We’ve been serving all of Southern California since 1971, and our top priority is keeping your kitchen safe and fire-proof. Join us as a regular client, and rest assured that your flue will always be sparkling clean, and your risk of a flash fire will diminish dramatically. Call 800-700-FLUE or email contact@fluesteam.com to get started today!